Saint Elizabeth became known to tourists only in the 1990s, but since then has become quite known for its beautiful natural environment and its charming, old-fashioned farming and fishing villages. The terrain is quite diverse. The Nassau, Lacovia, and the Santa Cruz mountain ranges rise in the northern and north-eastern parts of the parish. Runaway slaves in the 17th century used to hide in their caves. The lowlands consist largely of morass and pastureland. Along the coastline are some secluded beaches, the most famous of which is Treasure Beach, where the old-style fishing vessels made of hollowed-out trees can still be seen. In the waters are dolphins, lobsters, and manatees, as well as coral reefs where a wide variety of fish live. There are spectacular vistas from the high cliff known as Lover’s Leap. On the southwest side of the parish lies Fonthill Wildlife Sanctuary, home to endangered American crocodiles and a vast variety of birds. St Elizabeth is also known for its diverse population. The native Miskito group of Central America were given land grants here in the 18th century, while Americans, Spaniards, Portuguese, Irish, Germans, and Scots migrated here in the 1800s. Immigrant labourers from Latin America arrived some decades later. Remnants of St Elizabeth’s rich history can be seen here and there. Some early Spanish walls and wells are still standing. There is a lovely, 19th century stone church near the bottom of Lover’s Leap. The old Appleton rum distillery, once a sugar plantation, is still existent. Academic institutions established in the mid-19th century have survived in this parish which prides itself on the quality of its education. 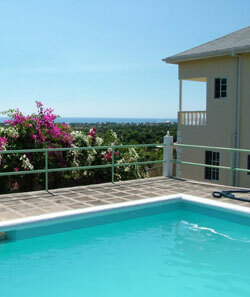 With its lovely and peaceful setting and excellent schools, St Elizabeth is a good place for families. This charming old town is the capital of St Elizabeth. It overlooks the river it was named after and the sparkling blue waters of the Caribbean Sea. In the distance can be seen the stunning Santa Cruz and Nassau mountains. A truly amazing view can be seen from Lovers’ Leap. 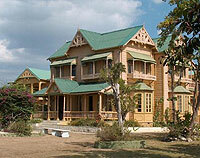 A former sugar port, St Elizabeth is one of the oldest towns in Jamaica and has a great number of historic attractions. There are many well-preserved 18th and 19th century structures, including fine examples of Georgian architecture and Jamaican adaptations of the British Colonial style. Houses frequently feature wide verandas, sash windows, jalousies and fretwork for good ventilation. These days Black River is a popular ecotourism destination. The river is inhabited by the Jamaican Crocodile, plus more than a hundred different kinds of birds, crabs, frogs, and fish sheltered by the mangroves that grow by the riverbanks. The Treasure Beach area consists of a number of little fishing villages where fishermen still build boats in the traditional Arawak style by hollowing out cotton trees and painting them in vibrant colours, though outboard motors have long replaced the paddles. The area is still quite rural, with a number of plantations here and there. A lot of goats can be seen in Bill’s Bay, where the most elegant villas in the area are. A string of sandy beaches is interspersed by rocks and tide pools. Fish, crabs, dolphins, and manatees can be seen from the rocks. The most popular beach is Fisherman’s Bay, though the smaller Calabash Bay has new hotels offering a good view of the fishing boats out to sea. Great Bay has a very pretty beach, but little tourist infrastructure. Hip, bohemian types are especially drawn to Treasure Beach. It is the main tourist area in the south coast and has some good restaurants.